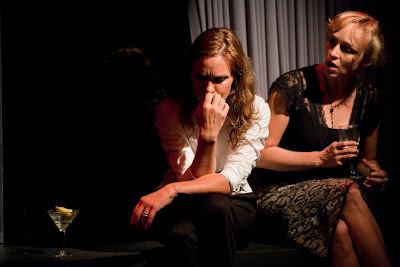 Griffin Theatre Presents SPEAKING IN TONGUES by Andrew Bovell at the SBW Stables Theatre, Sydney. SPEAKING IN TONGUES was first presented for the Griffin Theatre Company in 1996, directed by Ros Horin. The play became a success both nationally and internationally. Since that time the text was adapted for the screen as LANTANA and in 2001 won seven Australian Film Industry (AFI) Awards. This production by Sam Strong is a part of the Griffin’s 2011 season and part of a plan by that company to look back and revive plays from the past of the Australian repertoire. This production gives the audience a gift to re-engage with a very good and interesting play. It has the strength of a 'thriller' plot that unravels with easily identifiable people who are caught up in familiar contemporary relationship dramas framed by the greater movements of time and coincidences that the authorial, omnipresent writer makes his audience privilege too, with carefully plotted revelations that, cumulatively, may have the satisfaction for an audience who get a kick out of solving a complex jigsaw puzzle. Or not. This jigsaw, however, has considerable emotional punch. Mr Bovell says "SPEAKING IN TONGUES is about the right and wrong of emotional conduct. It's about contracts being broken between intimates while deep bonds are forged between strangers. It maps an emotional landscape typified by a sense of disconnection and a shifting moral code....It is driven by a sense of mystery". The play is written with nine characters for four actors. It is written in three parts and has, for its time in Australian writing, gestures of non-linear exploration and in verbal overlapping and synchronisation that Sam Strong, the present director, remembers as "being bowled over by". He goes on to say that he "hadn't seen anything like it before (and) found it exhilarating.." To the occasional or novice theatre goer this may still be the case, and one will either be "exhilarated" or bewildered, frustrated by the form. But to the regular theatre goer the form now seems only too familiar, it having being (created?) explored and taken up regularly by the contemporary European avant-garde (especially the German writing, of which we have seen a preponderantly unbalanced amount of in Sydney in the past few years: N.B. the Roland Schimmelpfennig at the STC New Stages program at present) and extensively developed further by other Australian writers like Tom Holloway (LOVE ME TENDER) and Lachlan Philpott (COLDER). Such as been the exploration and experiment in writing form that this play feels oddly dated, old fashioned. It is, however, Mr Bovell's "sense for our all too human vulnerabilities, contradictions and complexities (that) makes this piece ...timeless." SPEAKING IN TONGUES indicates the recurring thematic preoccupations of this writer: of child sexual abuse and its far-reaching tendrils of pain, revealed by the author's game playing with the 'tidal' rhythms of time and the possible fateful interconnections that made the 2009, WHEN THE RAIN STOPS FALLING, such a masterful experience (both the writing and a devoted production). After a shaky and too technically pre-occupied reading of the tricky overlapping and synchronised 'choral' demands of the first scene this company of actors gradually settled into a deeply committed and growing sense of ownership, embodiment, of the character's lives and dilemmas. Christopher Stollery, Caroline Craig, Andy Rodoreda and Lucy Bell all growing progressively securer with the ensemble trust of playing with and off each other as the Opening night progressed. Ms Bell as Jane in the first part gives a memorable decline into self-absorbed grief, and then creates in the second and third parts a tenderly ferocious vulnerability as the panicked therapist Valerie, that is the fulcrum of the 'body' mystery of the play. Andy Rodoreda also impresses with his turn with three characters, especially the morally ambiguous John. The Set Design by Dayna Morrissey is dominated by black, both glossy and flat. It has all of the defensive urban edge of bourgeois tidiness and expensive magazine art direction, that is unsettlingly disturbed with a small coup de theatre, with the opening of a panel into the reflected wilds of nature and the bush (jungle). The Lighting by Danny Pettingill, especially the particular and atmospheric second half is a beautiful abettor to the production envelopment. I felt that the Sound Design (by Composer, Steve Francis), was occasionally overwhelming, drawing too much attention to itself, and sometimes obfuscating the textual action. The experience of the evening was overall rewarding, the story telling and the character creating is assured, and will grow even more comfortable. Mr Strong has a clear and devoted vision of the play and its strengths. I felt there was sometimes an erring in the consistent need to rush the tempo of the work. Gentle pauses and/or permissions for hesitations in the actions of the actors may have given the audience more time to absorb and identify the characters problems and frailties. I note it because Ms Bell has a great moment in the first act, when, Jane, alone on stage, catches herself in the reflecting glass of the set, I felt a growing gasp of empathy in that reflection but it was cut short by the technicalities of the scene shift and I was taken to an objective observation of a near miss of total affect, instead of the subjective immersion into the character's journey. With time the tempo breaths may extend for the contrast of rhythmic emotional counter-point. SPEAKING IN TONGUES, then, is a very good night in the theatre. For those that only know the film, LANTANA, it will be an interesting experience to piece their memories of the more linear screenplay with the unique opportunities a writer has when creating, working in the theatre. A relative jigsaw puzzle of form as well as the familiar melodrama thriller of an apparent crime and police investigation. The Griffin policy of re-visiting the Australian repertoire is invaluable in attempting to establish a tangible sense of the heritage of Australian Dramatic Literature. More of it the better. So many good plays that had both good and flawed original productions are crying out to be revealed and found again. Alma de Groen's RIVERS OF CHINA or better still, THE WOMAN IN THE WINDOW. Dorothy Hewett's THE TATTY HOLLOW STORY - a flawed but quintessential Sydney play. Whoops, only women's voices so far (!!!) in my wish list. How about, then, on a bigger stage, Louis Nowra's THE PRECIOUS WOMAN (I know we could cast it fully with Australian/Chinese actors. Now, there would be a sign of cultural maturing, indeed). Louis Esson's MOTHER AND SON -I've only seen twice, at NIDA, in my theatre going life, never professionally. What would you like to see, instead of another Tennessee revival of THE GLASS MENAGERIE or a not so good David Hare? I am sure we all have a little list. I have a big list. Let the powers that be know.